Optimism has been in short supply around here recently. There are no end of things to worry yourself sick about; Peak Oil, water depletion, Global Warming, the emergence of new and exotic diseases and resistant forms of old ones. The list goes on and on. We don’t know what the carrying capacity is of this Earth, and the idea of finding out, as we have in the past, by trial and error, doesn’t appeal to me. For the majority of my adult life, I believed that the Rapture would be God’s provision against all of this. If you’ve been living under a rock since the 1970s, “the Rapture” refers to a belief that is all but universal among Evangelical Christians that the world will continue to get worse and worse until Jesus decides that he’s had enough and takes the really real good Christians to Heaven while He cleans the clock of the snuff-dippers, gamblers, whore-mongers, cynics, smart-assed news reporters, haughty secular humanists and anyone else who never Accepted Jesus Christ as their Personal Savior. For obvious reasons, this idea that Jesus will give us a brand new shiny Earth to play with after we have used up the old one has a strong appeal to Americans. However, I don’t know where people are getting the idea that Jesus is going to come and rescue them so they can drive their minivans right on up to the Pearly Gates. Everything I see in the Bible seems to indicate He’s gonna be hot under the collar. Nevertheless, my disavowal of the Rapture when I left Evangelicalism for Orthodoxy was considered one of the principal signs of my apostasy. I was glad to leave the Rapture behind me; I always considered it an irresponsible doctrine, but I hadn’t factored in the comfort value. It’s getting pretty dark down here, and I wasn’t so sure I wanted to continue without an evacuation plan. When I think about the situation in which we find ourselves these days, I visualize a large mass of people moving down a corridor where the walls are slowly converging. At first there is plenty of room and the mass of people are moving freely, but as the corridor becomes narrower and narrower, the people collide with each other more frequently. They experience each other as “being in the way”, as obstructions. The stronger gravitate towards the middle and the weaker are pushed to the sides. Eventually, there is room for only a few to pass through, and the conflict has become constant and endemic. No one seems to notice that the bodies are starting to pile up and have become in themselves an obstacle to further progress. I am reminded of the voice of the Scriptures: A woman giving birth to a child has pain because her time has come; but when her baby is born she forgets the anguish because of her joy that a child is born into the world. So it is with our lives; we are floating along peacefully, the centers of our own little universes, when suddenly we are thrust against our wills into a narrow, constricting place. There is pain, then light, then cold. We don’t like it, and we open our tiny mouths and complain. In order to survive the next two hundred years, we are going to need Jesus. It is not that we need to follow Jesus’ teachings more closely, or that we have to convince everybody that they need to believe some kind of ideology centered on Jesus. What we need is Jesus Himself – His divine/human personality with the divinity that He shares with His Father and the humanity which He shares with us through his Mother. Now, what puzzles me is that the pagans and the New Agers seem to be grasping something like this in their insensible way, but official Christendom seems pretty clueless. This is where Rapture fantasies come from, this confusion about Jesus’ agenda. I wouldn’t wake up in the middle of the night with panic attacks if Yeshua Ben Miryam was, say, the Secretary-General of the United Nations with full executive powers. I could sleep peacefully knowing a grownup was in charge. But Jesus left. And to make matters worse, He left on purpose. Nevertheless I tell you the truth; It is expedient for you that I go away: for if I go not away, the Comforter will not come unto you; but if I depart, I will send him unto you.. It is expedient, He says. And just when we needed Him so badly. But what did He leave behind? “A Book, a Doctrine”, say the classic Protestants, although they are scarce on the ground these days. “If we have continuity with this Doctrine, we are fulfilling the agenda of Jesus” “A Church”, say the Roman Catholics. “If we are members of this community, and in obedience to its leaders, we are fulfilling the agenda of Jesus.” But He said He would send the Comforter, the Spirit. But there are so many spirits abroad these days…. Now, Owen Barfield didn’t accept baptism in the Church of England until later in life, and he didn’t “come to Jesus”, as did many of us, because he felt ashamed of his whoring, drunkenness, or violent temper. According to something I read on a stray afternoon in a University labrary about a year or so ago, and I will dig up the reference if anybody needs it, Barfield decided to become a Christian because he noticed that certain elements entered the common life of humanity after the death, burial, and resurrection of Christ. These elements, furthermore, were qualitatively different from the psychical composition of humanity prior to the career of Christ and could not be explained as either a recombination or a development of earlier components. They were the evidence of a new kind of consciousness, a new kind of man. There were to be no more blood-gods, no more Great Mothers. The above illustration is from that most excellent journal, Touchstone, and I have “borrowed” it from an essay by David Justice which was published there some time ago. 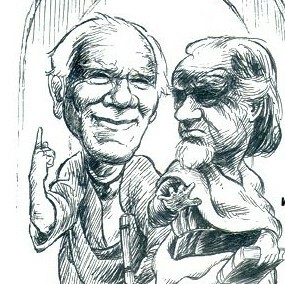 The two gentlemen, since gone to their respective reward, are Malcolm Muggeridge and Francis Schaeffer, and both of them embody a different stance towards Christianity and her truth-claims. The article is fascinating , and should be read in full. For the purposes of this post, though, let us just say that Schaeffer defended Christianity because he saw it as true, whereas Muggeridge defended it because it mattered. Indeed, reading through Muggeridge’s Christian writings, you come away with the idea that it doesn’t matter to him whether any of the events recorded on the pages of Scripture ever actually happened in the sense that, had you been present with a camcorder, you could have recorded it. That was the central issue of the modernist/fundamentalist debate that raged on the Continent in the early 19th century, in England in the late 19th century, and in America in the early 20th century. The question was deceptively simple – “Is the Bible true, or not?” “Of course!”, the fundamentalists scream. “Of course not!”, equally empatically, reply the Modernists. To be honest, the Pyrrhic “victory” of the Fundamentalists, or their heirs, has been due more to the unwillingness of the grandchildren of the Modernists to remain in Modernist churches rather than a retaking of the levers of culture occupied by the Protestant Hegemony prior to the conflict. Marija Gimbutas (1921 – 1994) is a name all of you should know. Fleeing the Nazi occupation of her native Lithuania in 1944, she settled in Southern California, eventually becoming a full professor of anthropology at UCLA. Dr. Gimbutas first attained prominence in the field of Indo-European studies by identifying a Neolithic culture of the Russian steppes, the Kurgan culture of appr. 4000 BC, as the speakers of Proto-Indo-European, the ancestral language of the majority of European and Indian languages spoken today. The Kurgans were a militaristic, patriarchal, and technologically obsessed society which, in various waves, dominated and submerged what she called “Old Europe”, a uniform (!?!?) Neolthic culture which was pacific, aesthetic, matriarchal, and meticulous about ecological relations to the natural world. Dr. Gimbutas’ theory of Indo-European procedence is not entirely accepted by scholars in archeology or linguistics. It remains a “fruitful” hypothesis, meaning , I suppose, one that can be perennially invoked to apply for grants and to lend legitimacy to articles published in scholarly journals. The jury is still out as to whether the Kurgans were indeed the linguistic great-grandfathers of Homer, the writers of the Vedas, Virgil, and the bards of the Cattle Raid on Cooley. Nevertheless, outside the more rigorous climes of official academe, her ideas took fruit in a series of novels written by one of her ex-students, Jean Auel, who had a good run of success with her “Earth’s Children” series, beginning with “The Clan of the Cave Bear”, which was made into a decent film starring Darryl Hannah. The Earth’s Children series degenerated swiftly from the original book, which was quite good from both a literary and imaginative perspective, into a predictable set of romances between the protaganist Ayla and a series of broad-chested, long-haired, sensitive Neolithic swains who followed her across Old Europe in obedience to the Great Goddess, whom they worshipped and who Ayla symbolized. I never finished the second book, although I have been meaning to. Whatever made the first book special is definitely lacking in the second. At any rate, Ms. Auel made Dr. Gimbutas’ speculations plausible to a host of moderns looking for a reason why their lives weren’t working so well. Gimbutean fiction is quite a lively sub-genre these days, with plucky, Goddess-honoring heroines standing shoulder to shoulder with brave, shining-eyed, long-locked heroes against the awful Horse People and their ferocious, oppressive Sky-God. The mythology is quite potent, which is why its not going to go away simply because it doesn’t have any basis in verifiable history. Christians, as usual, had their seismic triggers posted elsewhere and didn’t see Dr. Gimbutas coming up behind them.